MTV Hero Roadies is the only reality show of Television to come up with their 10th edition. No other TV Reality Shows has continued their journey as long as MTV Roadies. Hero Roadies 2013 Season kicked off on 19th January 2013 (Saturday) with a new format. Yes, Roadies X 2013 Season has come up with a unique concept & pattern. Suchit Bikram Singh - Suchit was the Roadie in Roadies-8 Season and was selected from Delhi Audition. Check more details about ex-Roadie Suchit. Mohit Saggar - Mohit was the Roadie in Roadies-8 Season and was selected from Chandigarh Audition. Check more details about ex-Roadie Mohit. Palak Johal - Palak was the Roadie in Roadies-6 Season. Avtar Nischal - Avtar was the Roadie of Roadies-8 Season and he was selected from Delhi. Check more details of Avtar Nischal. Rupali Anand - Roopali ex-Roadies was in the MTV Roadies 4th Season. Roop Bhinder - Roop was in the MTV Roadies Season 6. Diyali Chauhan - Diyali was selected from Delhi and participated in Roadies-9. Check more details of Roadie Diyali. Anirudh Sharma - Anirudh was selected from Hyderabad in Roadies-9 season. Check more details of Anirudh Sharma. Jahid Kalim [selected from 2013 Roadies X Pune Audition]. Geetika Buddhiraja [selected from 2013 Roadies X Chandigarh Audition]. Gaurav Singh [selected from 2013 Roadies X Hyderabad Audition]. Vikas Kumar [selected from 2013 Roadies X Delhi Audition]. Harry (Harmeet) [selected from 2013 Roadies X Delhi Audition]. Sonal Sharma [selected from 2013 Roadies X Delhi Audition]. Abhimanyu Gupta [selected from 2013 Roadies X - Battleground 5 Winner]. Ramandeep [selected from 2013 Roadies X Delhi Audition]. Swati Goswami [selected from 2013 Roadies X Delhi Audition]. Selection of Roadie for Rannvijay’s team is going to be done through Roadies X Auditions at various cities. The Roadies X Audition has Group Discussion Round & Personal Interview round for GD qualified candidates. Hero Honda, co-sponsor of MTV Roadies, will give away few ‘Hero Edge Card’ from their showrooms and candidates having ‘Hero Edge Card’ will get the chance of attempting five GDs while audition of Roadies X. This card will increase the chance of getting selecting for Roadies X Personal Interview round. 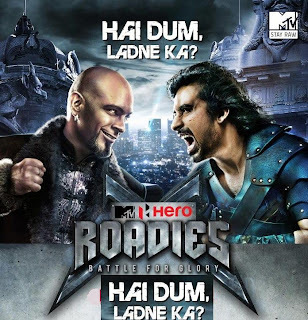 Roadies X 2013 Reality Show is aired on MTV Channel every Saturday at 7pm from 19th January 2013. At first, the Roadies X Auditions of various cities like Delhi, Kolkata, Mumbai, Chandigarh, etc will be telecast and then the Roadies X Show will begin. Roadies X Pune Audition 2013 & Selected candidates from Pune. Roadies X Chandigarh Audition 2013 & Selected candidates from Chandigarh. Roadies X Hyderabad Audition 2013 & Selected candidates from Hyderabad. Roadies X Delhi Audition 2013 & Selected candidates from Delhi. Roadies Battleground 5 Final Watch Online. Who will win the ultimate battle of Roadies? Hai Dum Ladne Ka? Battle for Glory – MTV Roadies X 2013 Season started and you can’t afford to miss an episode. Kolkata MTV Roadies 9 Audition Online Kolkata Selected Candidates Contestants MTV Roadies-9 Kolkata Audition Judges Anchor Host Moderators Venue Place Location Kolkata Roadies-9 2012 Audition Date Time Online Contestants Participants MTV Roadies 9 Kolkata Selected Roadies Kolkata Candidates selected MTV Roadies-9 Audition Kolkata Online Video Photo Hero Honda MTV Roadies-9 Selected Candidates Kolkata Audition names, Watch uncut episode of 2012 Roadies9 Kolkata Audition online live. Kolkata has always produced interesting roadies in past and that’s why Roadies Kolkata Audition always gets extra attention. Last year, Kolkata has produced Prachi Agarwal and before that Poulumi also got selected from Kolkata. The MTV Hero Roadies-9 Audition of Kolkata was organized at Swabhumi and the audition was so interesting that you would agree after watching & reading the below information. • MTV Roadies-9 Kolkata Audition Telecast Date: - 4th February 2012 (Saturday) & 11th February 2012 (Saturday). • Kolkata Audition MTV Roadies-9 Telecast Timings: - MTV Roadies-9 Reality Show starts at 7pm in the evening on Saturdays. • MTV Roadies-9 Kolkata Audition Judges: - Raghu, Rannvijay and Rajeev. • MTV Roadies 9 Kolkata Audition Anchor Host: - Roadie and Video Jockey (VJ) Bani J. • 2012 Hero Honda MTV Roadies 9 Kolkata Audition Group Discussion Round Moderators: - Harman, Gaiti, Umashankar, Gaurav, Susan, Filmy Zoro, Romance Rambo and many other crew members of MTV Roadies-9 does the tough job of selection in Group Discussion round. • MTV Roadies-9 Kolkata Audition Participants Contestants Candidates: - Many contestants had able to face Raghu-Rannvijay-Rajeev in the Personal Face-Off Interview Round at Kolkata 2012 Roadies9 Audition and here are the few participant names of MTV Roadies 9 Audition in Kolkata who got chance to face Roadies Judges in Personal Interview Round and unfortunately not become the selected candidates of MTV Roadies-9 Show from Kolkata – Stacy, Rohit, Farjaan, Vishal Chopra, Doctor VC, Shivani, Piyush, Anuj and others. • Selected Candidates MTV Roadies-9 Kolkata Audition: - Manali Banerjee is the lucky candidate (contestant) amongst thousands of competitor from Kolkata Audition of MTV Roadies-9 2012 Season who got selected for MTV Roadies-9 Reality Show from Kolkata Audition to give tough competition in Roadies-9 Show on MTV in 2012. Congratulations to Manali Banerjee for becoming the Roadies from Kolkata in MTV Roadies-9 (Everything or Nothing) season in 2012. Rajeev and Raghu is back in MTV Roadies-9 2011-2012 Season with VJ Ranvijay. In the Roadies-8 Season 2010, we all had enjoyed the tour of Brazil and Aanchal became the second female contestant to win Roadies. But, it’s good news to all Roadies and MTV Roadies viewers that Raghu is back in the upcoming MTV Roadies-9 Reality Show in 2012 for which the Registration process has been started. How to register in MTV Roadies 9 – 2011-2012 Season? CEAT and Hero Honda present MTV Roadies-9 Reality Show offering the Prize Money of Rs. 3 Lakh. CEAT presents MTV Hero Honda Roadies Battleground 4, which is the one-time chance to get direct entry into Roadies 9 and win! Good wishes to all the Contestants of MTV Roadies 9. Tags: MTV Roadies 9 Reality Show, CEAT Hero Honda MTV Roadies 9, MTV Roadies 9 Battleground 4 Online Audition, Roadies 9 Battleground 4 MTV Show 2011 2012 Watch Online, Registration Audition MTV Roadies 9 Battleground 2011 2012 Season, Prize Award money Roadies 2011 2012, Raghu Ranvijay Roadies Judges, Watch Online Episodes MTV Roadies-9 2011 2012 Season, How to register MTV Roadies Registration process procedure to get entry to MTV Roadies TV Show.